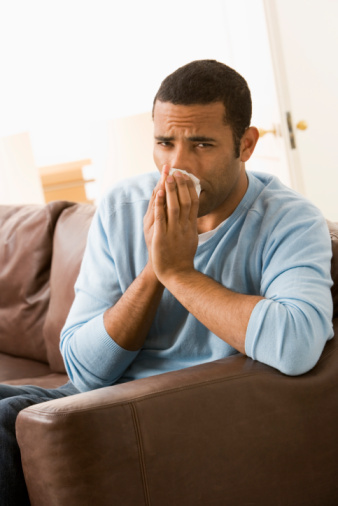 Dry air in a home can be a real problem for some people. Skin dryness, congested sinuses and the possibility of issues like nosebleeds, bronchitis and sinus infections often lead people to purchase an appliance that helps increase humidity. Steam vaporizers are easily confused with humidifiers. This makes sense, as both steam vaporizers and humidifiers convert water into gas for the purposes of delivering moisture to the atmosphere to improve air quality. Both humidifiers and vaporizers are also designed to lift the air quality in a room to between 40 and 50 percent humidity. The difference between these two devices lies in the type of humidity they produce. Steam vaporizers (also called "warm mist" vaporizers) contain a heating element that boils water and releases the steam into the room to create moisture, whereas humidifiers break up cool water particles with the use of a spinning disk that stays submerged in the water. Some humidifiers do have a "warm mist" feature, making them very similar to steam vaporizers. Steam vaporizers are generally considered to be easier to maintain than humidifiers, primarily because the stagnant water in the humidifier tank can easily accumulate mold or mildew, requiring near-constant maintenance and cleaning to remain safe and healthy. While steam vaporizers should also be cleaned every one or two weeks, the mold and mildew risk is significantly decreased because the water is boiled and evaporates, versus remaining in the receptacle. Additionally, steam vaporizers are generally more affordable, and as an added bonus, inhalants like essential oils or medicinal vapors can be added to the vaporizer improving the respiratory benefits of the increased humidity. How Do Steam Vaporizers Work? Steam vaporizers work by heating the water and expelling the steam. To use a steam vaporizer, you fill the chamber to the indicated fill line with fresh, filtered water. Adding hard water can cause a buildup of scale and lime, so it's best to use pure filtered water. Once the vaporizer is plugged in and turned on, internal burners begin to heat the water slowly, bringing it to a boiling point where it changes from liquid to gas. The gas is then pushed out of the vaporizer through a hole, and fed into the surrounding air. This will continue until there is no water left in the receptacle, or until the vaporizer is unplugged. Some vaporizers do allow you to set a timer that will shut the vaporizer off completely. Beyond steam vaporizers, there are a number of other types of vaporizers which can improve the air quality in your home. Ultrasonic vaporizers utilize the generation of ultrasonic waves to create a humid mist. When plugged in, a metal plate begins to vibrate. The vibration increases in frequency until it actually separates the water in the receptacle into tiny droplets which are then pushed out into the air. Impelling vaporizers work similarly to ultrasonic vaporizers, only instead of a vibrating metal plate, an impelling vaporizer features a spinning metal disk that lifts the water into tiny droplets and hurls it at a diffuser which breaks the water into even smaller droplets and shoots it out into the room. An evaporative vaporizer essentially regulates itself and responds to the moisture in the air. A cloth wick pulls water from the filled receptacle and a high-speed fan blowing on the wick releases the moisture into the air. The less humidity in the surrounding air the more water will evaporate from the wick.